You've seen how you can collaborate with members of your team by sharing your roadmaps with them. 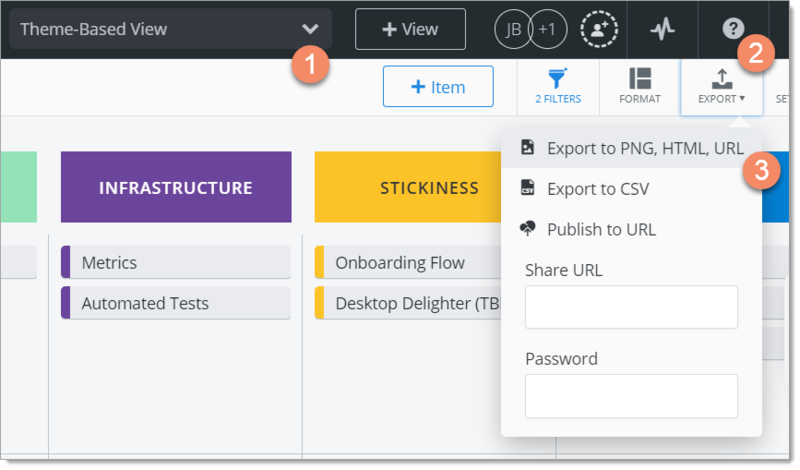 In this article, we show you how to export a roadmap view's Timeline or Swimlane to a PNG or HTML file so it's boardroom-ready and can be shared with your customers and other stakeholders who may not have access to your account. Choosing to export to a PNG file or an HTML file depends on how and where you want to use the output. For the differences between the two formats, see the PNG or HTML? section later on in the article. 1. In the View dropdown on the Roadmap navbar, select the view you want to export. You should see the Timeline or Swimlane icon selected in the View navbar, depending on the view's visualization type. 3. In the dropdown, select Export to PNG, HTML, URL. You should now see a preview of what the file will look like. 1. On the preview screen's top navbar, click the PNG or HTML icon. If you don't like how the preview looks, click the X in the top-right corner of the screen to go back to the view, make the changes you want, and then re-export. Background: Select Transparent or White (default) for the image background. Extras: Select the view properties you want to appear on the image: Title (roadmap and view names), Legend (what the colors mean), and/or Footer Text. All three are selected by default. 3. Click the Download to PNG or Download to HTML button at the far right of the toolbar. Exporting a view as a PNG image is right choice if you want to insert the image in a printed document or embed it in a PowerPoint presentation, video, or web page for presenting on screen. HTML is the right choice if you want to create an interactive version of your view. Exporting to HTML creates an interactive web page with items that can be clicked to display item details like date range and pivot field values. 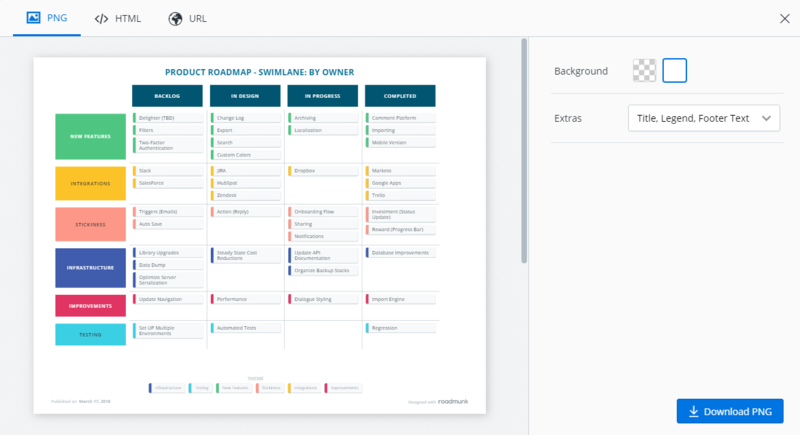 Unlike roadmap items and milestones, anyone with access to a roadmap can export its views to PNG or HTML, including the roadmap's Owner and users sharing the roadmap as an Editor or a Viewer.